With its traditionally Western connotation, the ranch suit was an appropriate choice for Mary Ann, Gene Hackman’s character in Prime Cut, to wear during the Jayhawker Fair that leads to his fatal confrontation with mob enforcer Nick Devlin (Lee Marvin). Nick had arrived from Chicago the day before on behalf of the Irish mob, seeking financial restitution for Mary Ann’s previous misdeeds. “You know, my family were Americans while your family was still diggin’ the bugs out of Irish potatoes,” declares Mary Ann, taking a few jabs at Nick’s heritage that would have been fitting in an 1850s issue of Punch magazine. Nevertheless, an exchange is made… only for Nick to discover that Mary Ann had merely handed him a package of beef hearts. You’ve seen them in plenty of movies, TV shows, and possibly even real life… but what exactly do you call that decidedly Western-styled take on a business suit with enough pointed yokes to pull a plow? Meet the ranch suit… or, alternately, the Western suit. One nearly universal aspect of what differentiates a ranch suit are the pointed “Western” yokes on the front and back of the jacket. From there, designers have the freedom to deck it out with arrow detailing, suede patches, pointed pocket flaps to echo the yokes… items all found on this brown suit offered by Spur Western Wear. 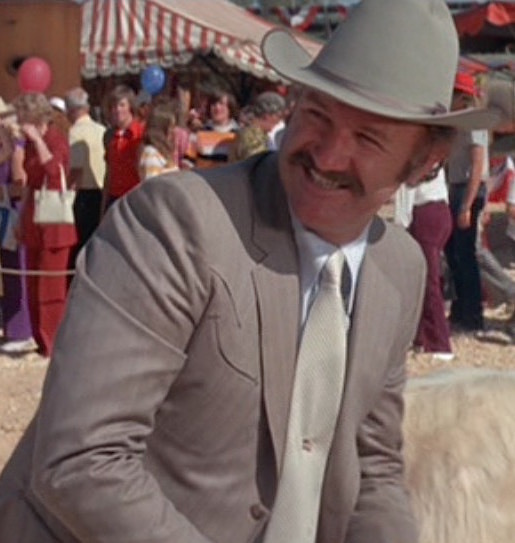 Given the array of style options available to the ranch suit designer, Gene Hackman’s taupe striped ranch suit in Prime Cut is surprisingly conservative, with only the curved “smile” pockets on his chest accompanying the pointed yokes as decidedly Western details. A “smile” pocket is merely a jetted pocket with a slight convex curve, named for its resemblance to a gently smiling mouth. As we see on Hackman’s suit jacket, the “smile” pocket is often angled and accented at each corner with a stitched arrow detail. Mary Ann’s ranch suit jacket is otherwise cut and styled similarly to a standard lounge jacket with notch lapels of moderate width that roll to the top of a single-breasted, three-button front. The straight shoulders are roped at the sleeveheads, and each sleeve is stitched at the end to resemble a cuff with two small, non-functioning “kissing” buttons. The hip pockets are straight and jetted, unlike many ranch suits or Western jackets that opt for pointed flaps on the hip pockets. I’ve watched the scene and reviewed my screenshots several times, and I remain mystified by this jacket’s vent situation. Initially, we see Hackman with what appears to be a long single vent cut in the back of his jacket, but this alternates with other shots that clearly show what appear to be double side vents. What is this sorcery? An recherché triple-vented jacket? A vent for each yoke point, perhaps? The flat front trousers also incorporate traditional ranch suit detailing like the pointed “keystone” belt loops and frogmouth front pockets. The back pockets are jetted with a single loop for a button to close each. The fit is straight through the legs with plain-hemmed bottoms. Mary Ann’s tooled leather belt is brown with darker edges that grade to a lighter center with ornate tan detailing. He wears a large, oval-shaped buckle in polished brass with an embossed rim and embossed square center. Cowboy boots are naturally Mary Ann’s footwear of choice, though little is seen of his tan leather boots. Not Mary Ann’s finest moment. 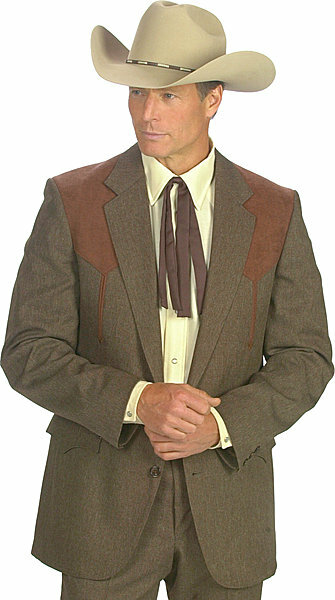 And what shirt to wear with a Western-styled ranch suit? A Western-styled snap shirt, of course! In this scene, Mary Ann wears a pale blue cotton shirt with pointed yokes (two on the front, one on the back) and the same curvy “smile” pockets as we saw on his suit jacket. The shirt has a long point collar and mother-of-pearl snaps up the front placket, with at least three matching pearl snaps on the cuffs. Mary Ann’s bad day just keeps getting worse. Mary Ann’s silk tie appears to be a taupe mini-grid on a cream ground, creating the appearance of a solid ivory silk tie from a distance. Although a traditional self-tying tie is always the best way to go, we do know that Mary Ann is not opposed to sporting the occasional clip-on tie… despite being older than 7 years of age. Mary Ann shows his patriotic pride by wearing a small American flag pin mid-torso to keep his tie in place. Mary Ann wears a traditional cattleman-style cowboy hat in pearl gray felt with a narrow taupe grosgrain band and edge trim. All of Mary Ann’s jewelry is limited to his left hand with a gold analog watch with a black dial strapped to his left wrist on a gold bracelet. Throughout Prime Cut, he wears a plain gold wedding ring on the third finger of his left hand, but he complements it here with a silver pinky ring as well. This isn’t Mary Ann’s only ranch suit, as the brown striped trousers he wears when “rough housing” with his brother Weenie (Gregory Walcott) almost definitely have a matching jacket in a similar Western style. However, we never actually see Gene Hackman sporting the jacket in the finished film as it spends its screen time slung over the back of his chair. 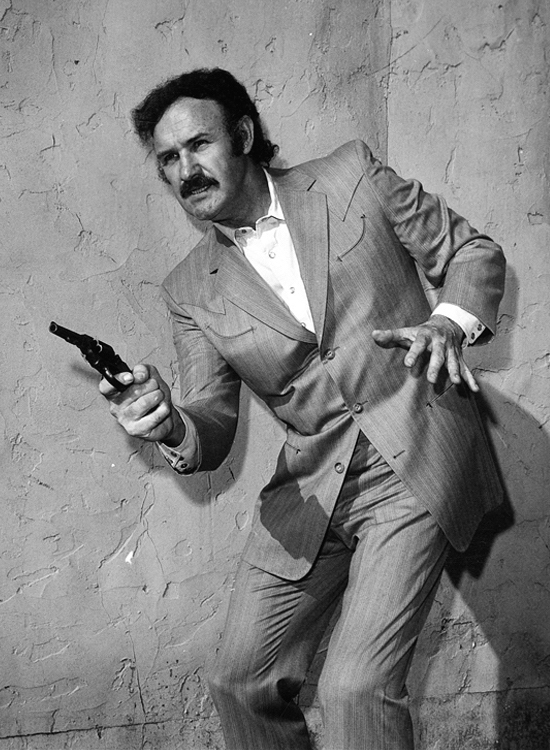 Promotional photo of Gene Hackman in Prime Cut (1972), sans tie and armed with a revolver rather than the 1911-style pistol he uses on screen. Gene Hackman’s Mary Ann in Prime Cut sticks to his Western persona with a classic ranch suit, snap shirt, cowboy boots, cattleman’s hat, tooled leather belt, and big flashy buckle – consistency is key for pulling off this look. Mary Ann’s weapon of choice when duking it out with Nick Devlin is a classic M1911A1 semi-automatic pistol, likely meant to be the classic Colt Government model in .45 ACP. Mary Ann’s position may give him an initial advantage, but even with a 1911, he is severely outgunned by a submachine gun-toting Nick Devlin. Many films of this era – including The Wild Bunch, The Getaway, Dillinger, and Three Days of the Condor – substituted the Star Model B, a Spanish 9mm clone, when a scene’s context called for a 1911. At the time, .45 ACP blanks didn’t cycle as reliably as the 9×19 mm Parabellum ammunition chambered in the Star pistol. Mary Ann’s pistol is never seen closely enough to determine if Hackman is firing a Star Model B or a genuine Colt-style 1911A1. You think I don’t know this country? I know it. This is my country. I give it just what it wants: dope and flesh. Fear not – there are plans for BAMF Style to write about the flashy duds sported by Lee Marvin as Nick Devlin within the next few months! Alice Cooper had a song called Mary Ann with the last line being “I thought you were my man”. The 3 vents are weird. Maybe they are 2 different jackets and the scene was filmed over a long period and they swapped jackets between takes. Perhaps first one used got hot and sweaty and for later takes they swapped over to another stand by jacket. Or Gene split food on it at lunch break and they had to use the 2nd jacket filming after lunch. Silly things happen on film sets, even big budget Hollywood films.